Happy Birthday, Florida! also includes many little known facts, a whimsical look at fun places in the state, and is loaded with resources. 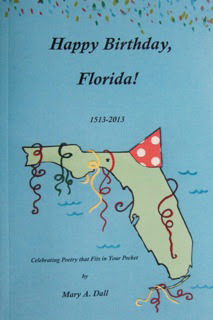 Help celebrate Florida’s 500th Birthday! Black and white illustrations complete the package. The book sells on-line at Amazon for $8.99, but Mary discounts her books at book-signings, conferences, or workshops.